Recipe submitted by Kally Mavromatis, from Cleveland Clinic Healthy Heart and Lifestyle Guide and Cookbook. Tabbouleh is a popular type of Middle Eastern salad made from bulgur, parsley, mint and tomatoes seasoned with olive oil and lemon juice. 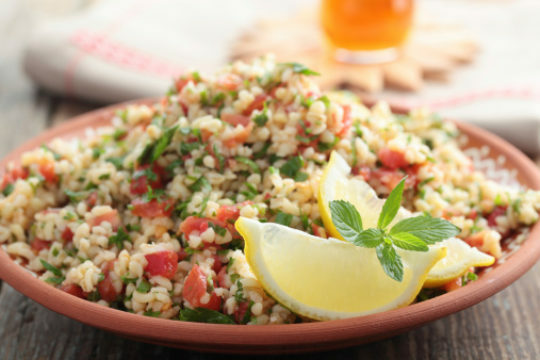 This tabbouleh recipe uses extra lemon juice and more fresh herbs. The result is incredible – a delicious taste of lemon with every bite of grain and a burst of freshness from the blend of fresh herbs with every mouthful! Bring kettle of water to a boil. Stir together the bulgur and 1 tablespoon of the olive oil in a heat-proof bowl. Add boiling water to cover. Cover bowl tightly with plastic wrap and let stand for 15 minutes. Drain in a sieve, pressing on the bulgur to remove any excess liquid. Transfer the bulgur to a large bowl, and toss with the remaining tablespoon of olive oil and the rest of the ingredients until everything is well-mixed. Cover and refrigerate for at least three hours. Serve cold. Dietitian's Note: Although high in the percentage of calories from fat, this salad is low in total calories and a good source of dietary fiber and monounsaturated fat. The Cleveland Clinic Healthy Heart and Lifestyle Guide and Cookbook are available from Random House, Inc., or wherever books are sold.